OMAC, Once a Month Cooking, Session Cooking, Freezer Cooking all different names for basically the same thing. Getting food made and in the freezer to make life easier. I decided I wanted to do this. We get home from work it is late, we get cleaned up and in comfy clothes (because really work clothes don’t stay on for long once we get home, it is a race to get our comfy PJs on to relax, anyone else like this? ), dogs loved on, then cook supper, do dishes, barely have enough time to watch some TV, and then it is time for bed. Grr… So a lot of the time I don’t want to cook. We eat out, order in Pizza, eat some weird TV dinner thing that has been in the freezer far too long, or more often than not we eat on of our three go to meals – Popcorn, Chips and Salsa, or Pepperoni and Crackers! So some form of freezer meals sounded good. The first try was loading up at Sam’s every 3 months. And when I say load up, I mean load up! We literally did not have to buy meat again for those three months. I would crock pot up a roast for Fajitas and then freeze the leftover in individual bags, same with ribs, pork tenderloin, and browned hamburger meat. It made life a little easier. But the stuff in the freezer was hard to keep track of, and other than those few things I still have to cook everything. Some more research lead me to Once a Month Cooking and Freezer Cooking, and I think I was able to come up with a system that works well for our lifestyle here at The Den. I don’t need everything to be cooked. My Stir Fry and Chicken Scampi for example are something I worried about freezing. But what takes so long there? The prep work. 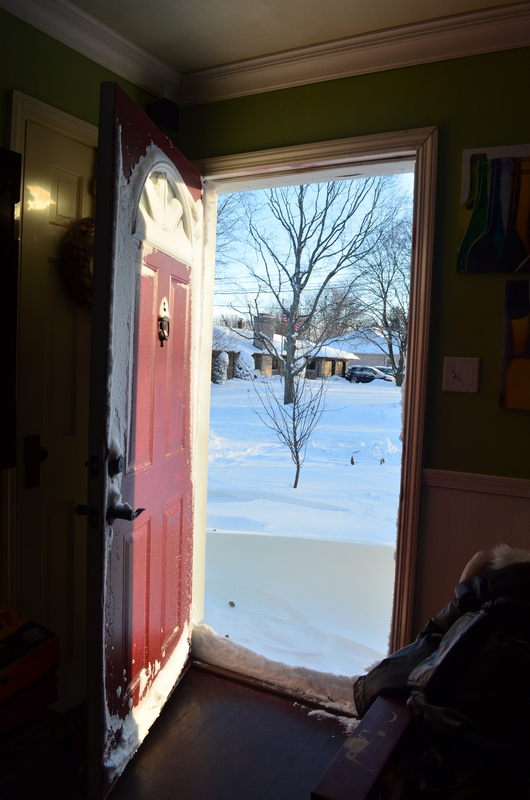 The first step was to invest in an upright freezer. It would be easier to see everything, keep it organized, and hopefully stay on track. Luckily there is a big box store going out of business nearby so I was able to score a great deal. Otherwise we’d still be waiting to start this plan. The next day I stocked up on groceries and came home to get the meals together. Wolfy helped all day so if you are by yourself be warned it will take a while. I started prepping onions while Wolfy found a cleaned out the proper cooking devices. We like onions in our food so I chopped three bags of onions (9lbs I think) in the food processor. I put these in a bowl and just took what I needed for each meal. The left overs were frozen. The three bags were then put into a gallon sized zip top bag with still packaged rice noodles and the frozen. It will be super easy to pull the bag out the night before, let it thaw, and then whip up a delicious home cooked meal. We ended up making enough for 52 meals. Can’t beat that. That is 52 suppers that are ready or almost ready to eat. That is a minimum of 7 weeks of food. I say minimum because a lot of those meals will have leftovers and then there will still be the days that I just want a salad for supper. Plus we have the 25 fish fillets for Wolfy that we purchased while in Destin during the beginning of March. I also made up Sub bread so we could take sandwiches every day for work. The goal is to get ahead of those and have several in the freezer. Right now on every other weekend I plan to make one or two more types of meals to add to the freezer. This will do two things. One, it keeps the number of meals in the freezer up so we don’t need to do an all-out cooking day. Two, it adds to the verity of the meals we have to choose from. For example last weekend I made a huge batch of Chili which worked out to be 7 meals for us and more than made up for what was taken out of the freezer in the past week. Next time I plan to make a bunch of hamburger patties and chicken packets up so we have something to grill as the weather gets nicer. I also plan to make a few batches of Amish Friendship Bread up so there are plenty of regular sized and mini muffins frozen for snacks and breakfasts. Why every other week? That is when I am going grocery shopping. I have it figured out that I still need to go to the store every other week to stock up on soda (yes, we still drink soda, don’t judge), fresh veggies, and whatever ingredients are needed for a few more meals. So what do you think? Is this something you do at home, have done, what to do? Is this journey even something you want to hear about? If so I am more than happy to share my freezer recipes as I figure them out. Categories: Recipes | Tags: Freezer Cooking, OMAC, Once a Month Cooking, Session Cooking | Permalink. 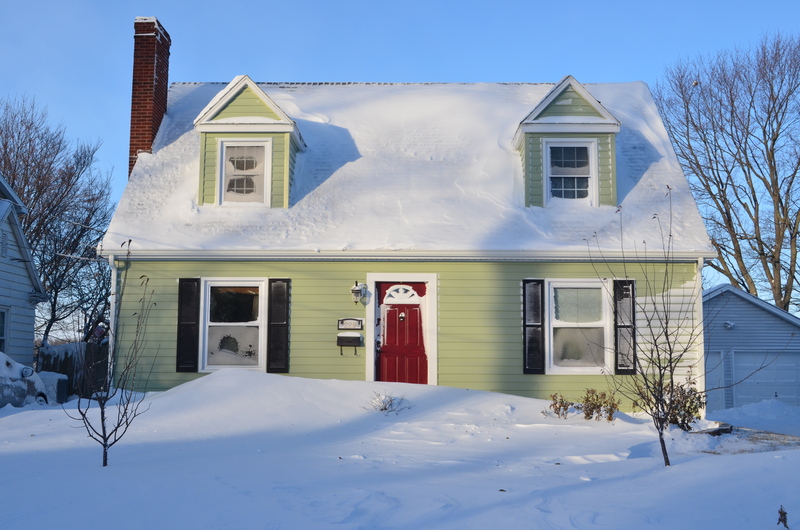 How did you fair in the Winter Storm / Snowstorm Ion? 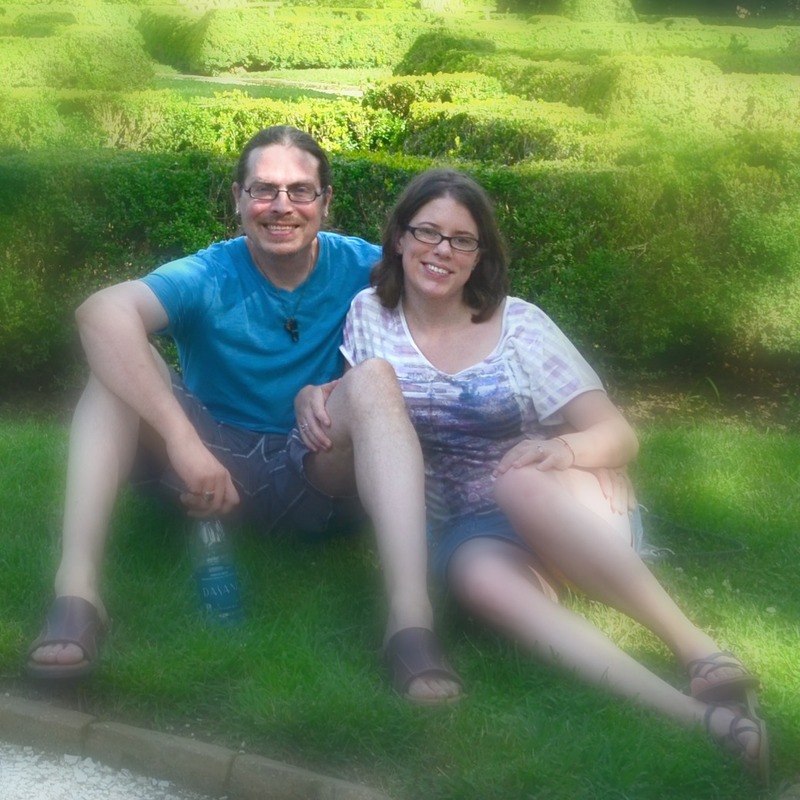 I thought I’d show you some pictures of our interesting weekend. 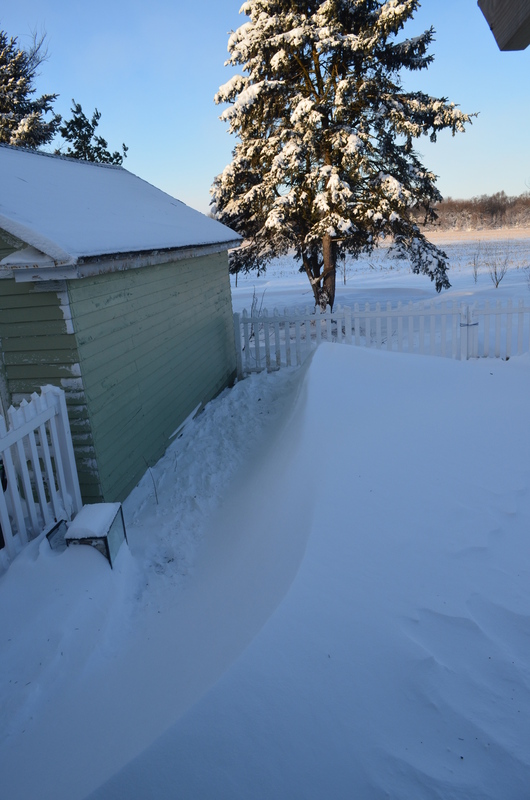 This is the most snow we have had in 35 years in central Illinois, and record breaking cold temperatures. The snow started on Sunday. Around 8:30 when I got up to let the dogs out there was a good 6 inches on our front deck. 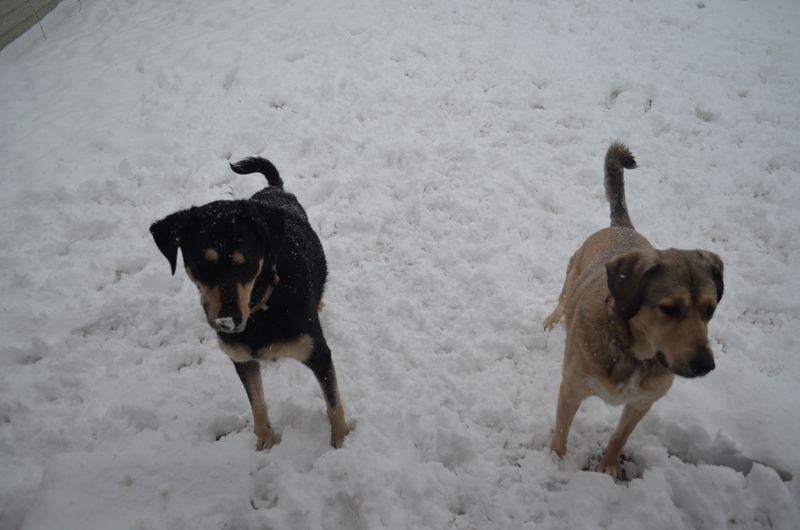 But at this point the temperature was still pretty good and the dogs were able to play and have a good time in the fresh snow. 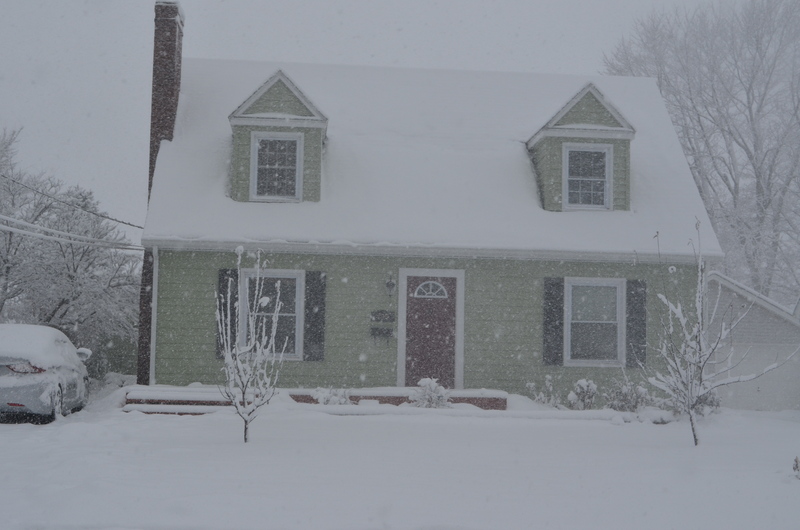 About 2 hours later I could hardly stand to be outside taking pictures. The world looked like this. Monday morning found us snowed in and most of the roads closed. It was so bad Sunday night that they stopped the snow plows and pulled them off the roads from dusk until dawn. The wind chill was a -35 and the wind was blowing hard. I was able to go out and get some more photos, but by the end of the day the landscape looked different do to more drifting. My faith in humanity was restored during this snowstorm. I saw lots of people out helping their neighbors. It seemed like the good deeds were being passed around. 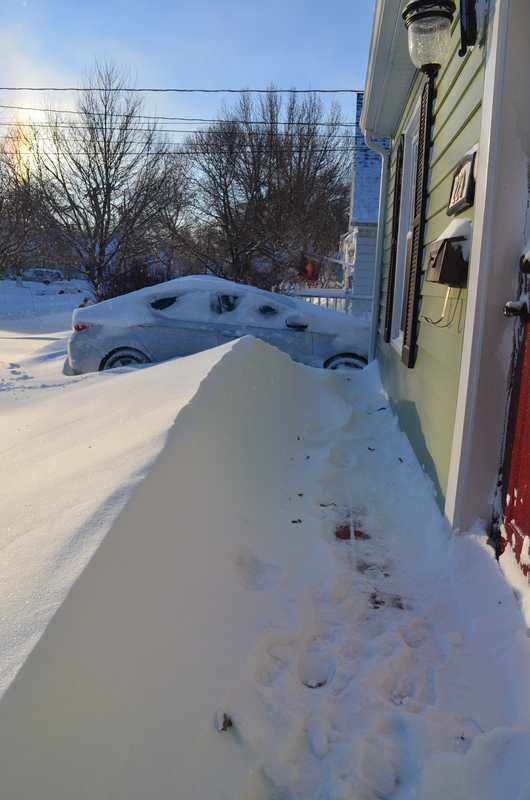 I have to say a big shout out to our neighbor when saw us struggling with digging our car out came over while we were taking a warming break inside and used his snow blower to remove the snow from our drive way. Thank you Sir! It was really nice to see our community banding together to help each other out. I hope everyone is safe and warm by now, I really hope you stayed safe and warm during the weather. I’m not sure where you are, but for us the Weather Channel says it is going to start snowing again this afternoon and some ice later in the week. With our main roads and highways still solid ice, not the news I wanted. 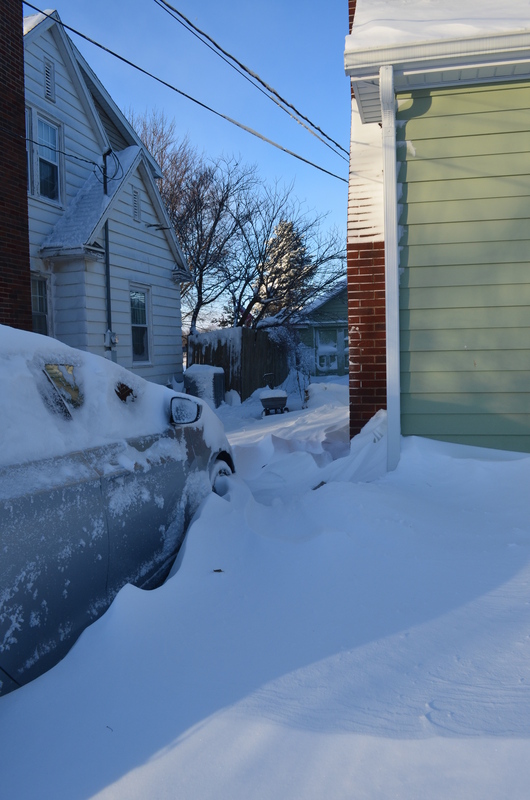 Categories: Outside, The Den | Tags: Ion, Snow storm, Snowstorm, Snowstorm Ion | Permalink. We love to watch TV together. 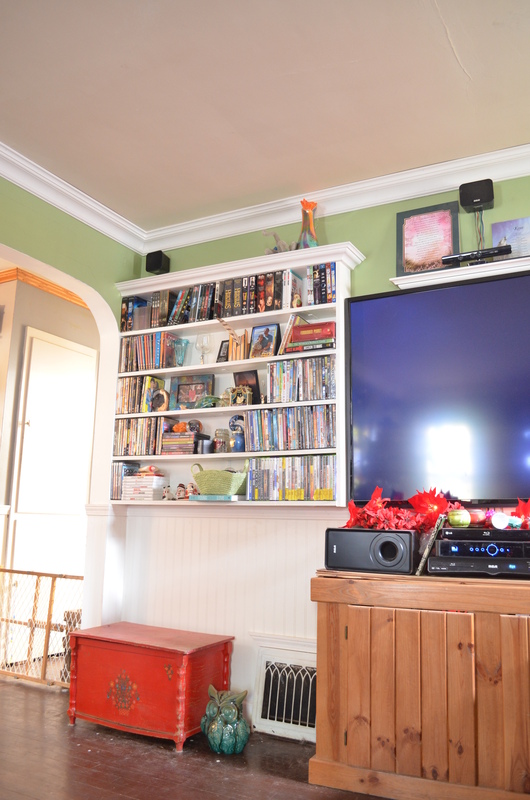 When we laid out our living room we centered the TV on a large wall and spent a lot of time looking at. 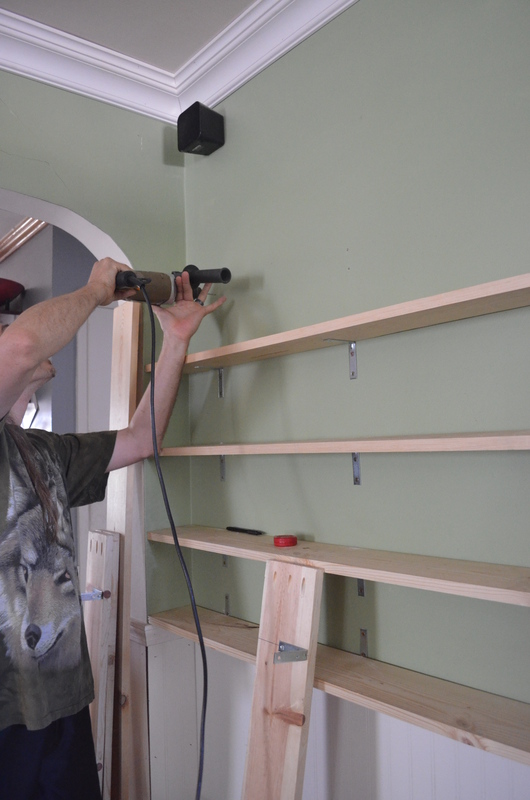 Getting tired of the extra unusable space next to the TV we decided on building in some shelves. 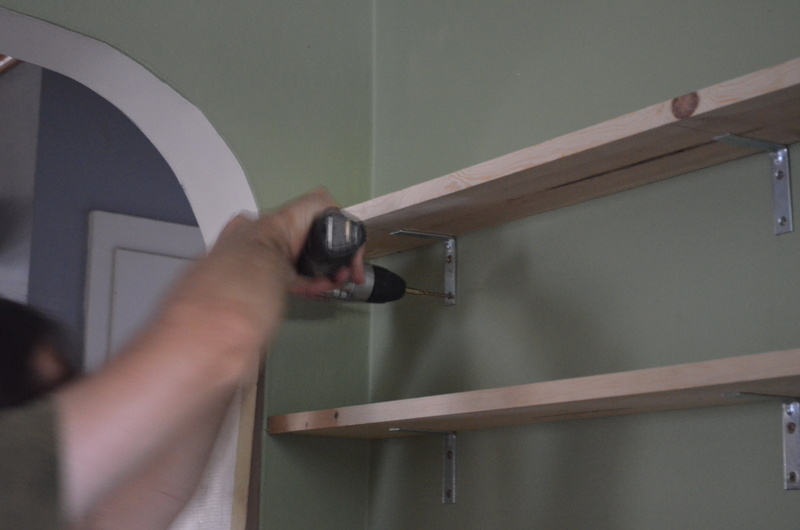 A simple shelf project lead into creating a shelving unit with the appearance of built ins. Over all it was a pretty simple project. The hardest part was finding boards that were straight. The storage was designed for DVDs. 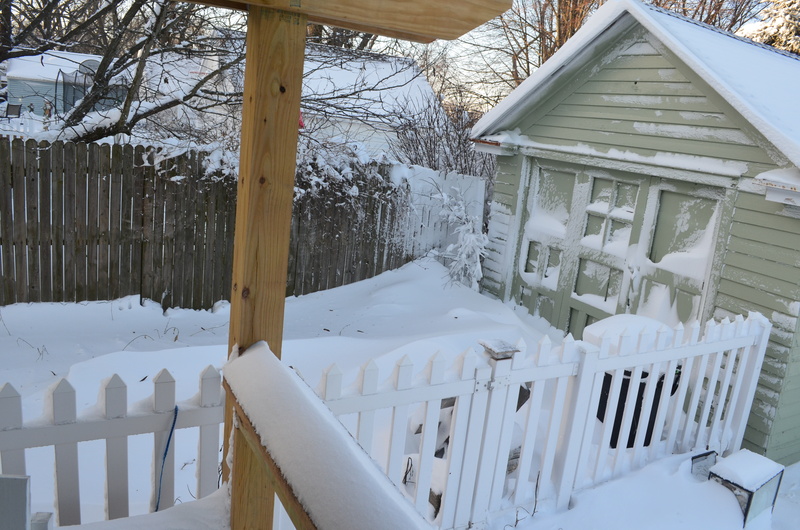 We lucked out – see the bump out in the wall? That is the perfect depth for a DVD. 1X6 boards also worked perfectly. We kept things really simple. 1X6s cut just over 4 feet with L brackets holding it up. We used a DVD case to determine the height between the shelves. 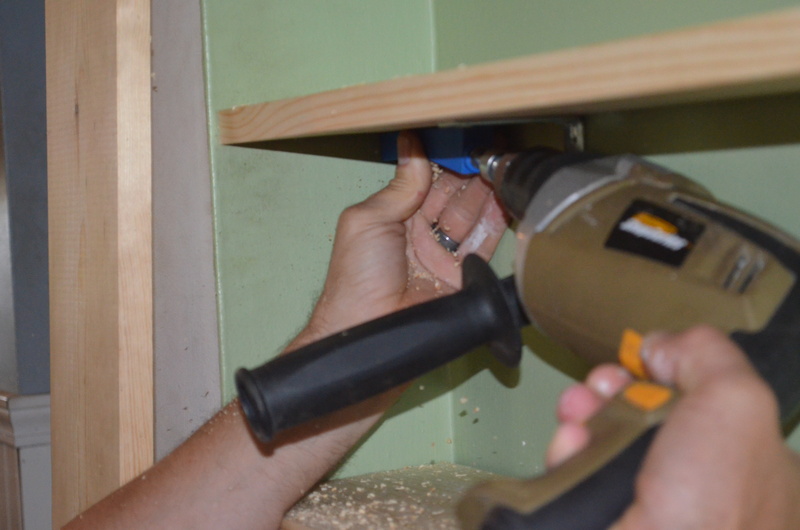 I held the board level, Wolfy marked the holes, predrilled, and then we were able to screw the shelf to the wall using 3 inch construction screws. With all the supporting in the back of board we decided to use our Kreg Jig to drill support holes in the ends of the boards. One side ends up getting screwed into the wall the other side will get screwed to another board. 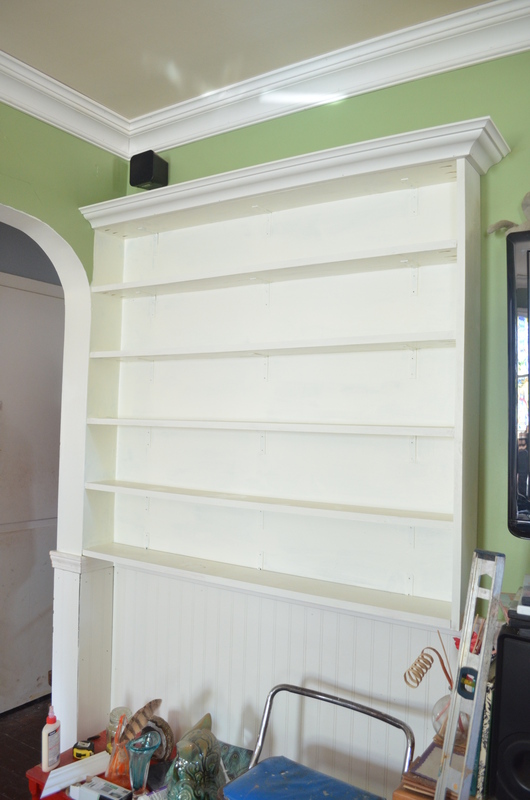 Once all the boards were installed ( and a long debate) we painted the unit (and the wall behind it) white, added crown molding to finish it off, and caulked it. I pretty happy with the way it turned out. Once we loaded it up with DVDs and knickknacks it started to look like us. We left enough room next to it to fit out 70” TV which was our Christmas present to each other. So what do you think? Do you have something similar in your home? Would you want something similar in your home? Or did you have it and demo it? Happy new year everyone! I hope you all had a wonderful Halloween, Thanksgiving, Christmas, New Years, and/or Holiday Season! Life has been hectic at the Wolf Den the past two months. 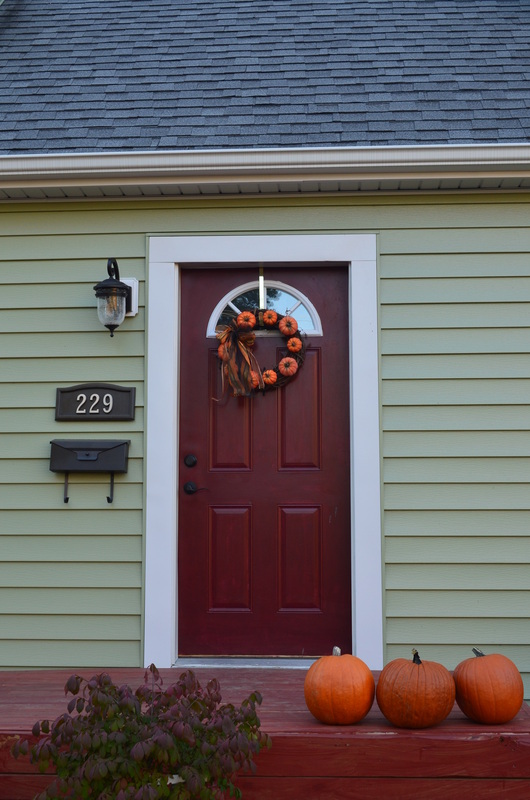 October starts a time that is both hectic in our home life and our professional one. But you should be seeing more of us now. I did some soul searching over this holiday season and decided that we need to change our plan about the current den. Neither one of us are completely happy living in town and have been keeping an eye out for anything that looks interesting. No more! We are moving forward. The plan is to finish a few things on the house and list it. Not everything will be done, but the things that need to will be. If the house sells, great! If not, we still have some time to finish everything. Hopefully we will walk away with enough money for a sizable down payment for a house and workshop in the country. Retile in front of fireplace? My goal if everything goes according to plan is to be in our new home with a good sized chunk of land and a fenced in yard so the dogs can bark their heads off this time next year. Will it happen? Maybe, maybe not. Will we get the house in any shape to list in the next 6 months? I don’t know yet. But I need a goal to work toward; otherwise nothing will be able to change. Posts will also be changing. I will not be posting every day. I will try to post 2-3 time a week. 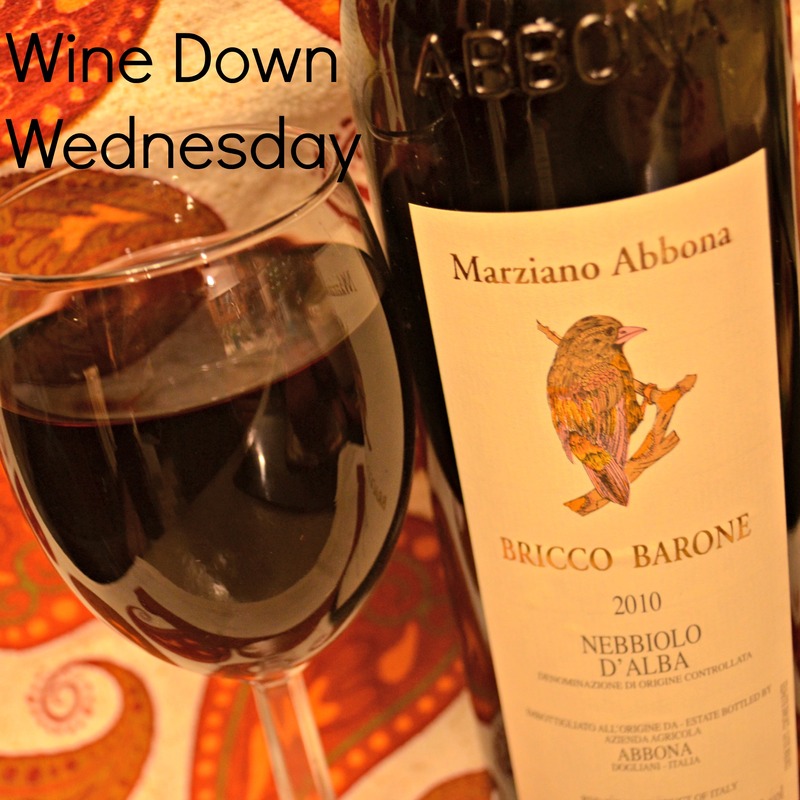 I do plan to keep up with Wine Down Wednesday and to still share recipes, crafts, and any traveling. But most of the posts are going to be about that list and the other assortment of things that come along with finishing a house, getting ready to sell and of course, somehow bringing a home to a corn field. 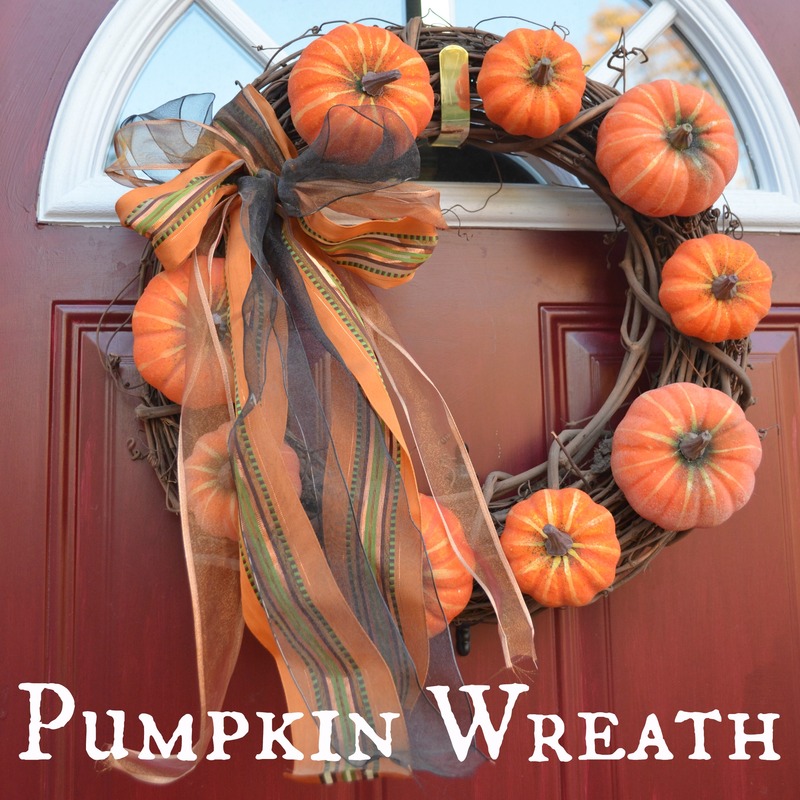 I love this pumpkin wreath. It is super easy to make and add a pop of fall that is perfect to have on the wall from October until Thanksgiving. 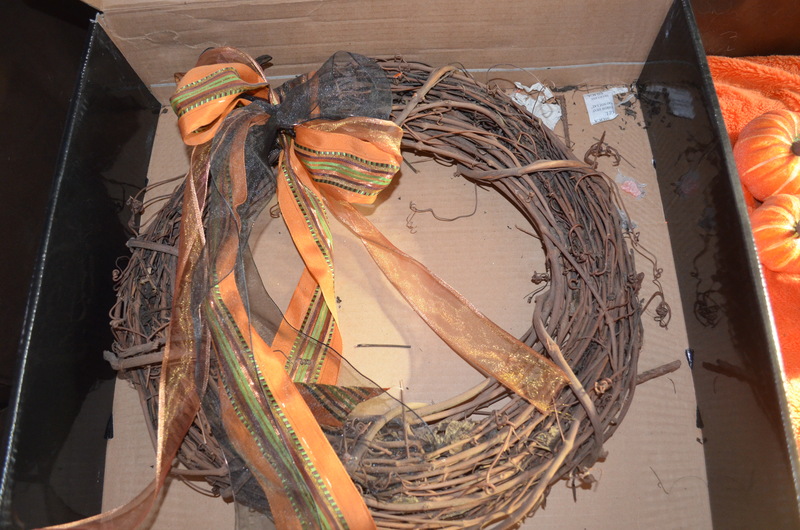 Cut three equal sections of ribbon to tie onto a grapevine wreath. 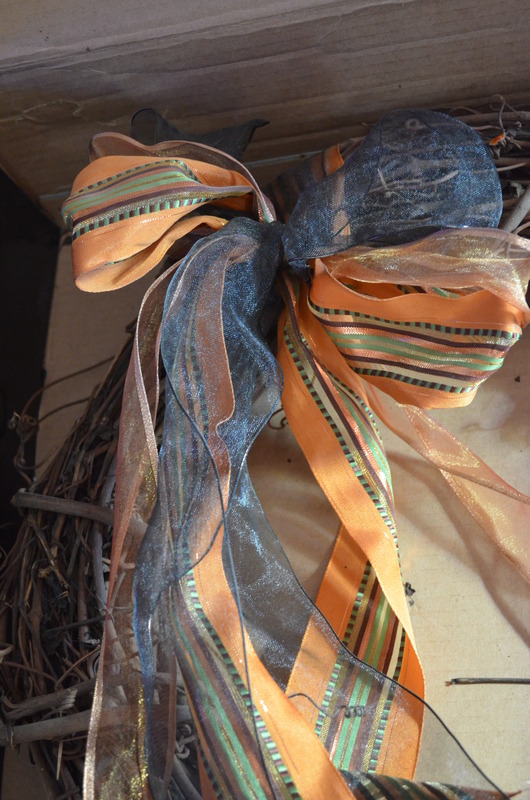 I used a transparent orange, transparent black, and a fall patterned orange ribbon. Wrap it around the wreath and tie into a bow. 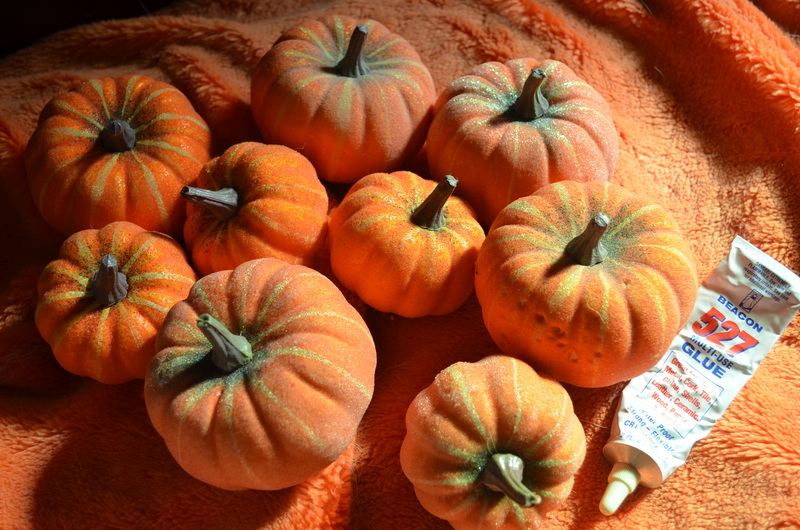 I found the plastic pumpkins several years ago at Wal-Mart. The next step is to glue them onto the wreath. 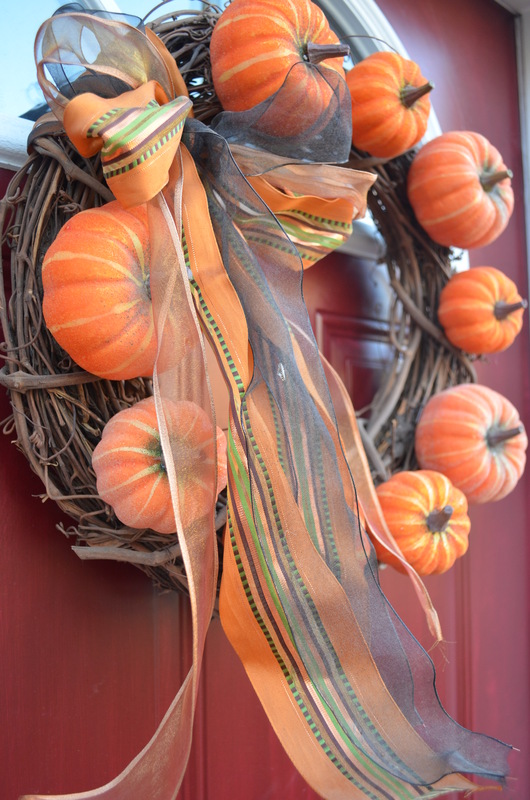 When I originally made this wreath two years ago I attached the pumpkins with hot glue. I kept having problems with the pumpkins falling off. So I ripped them all off and re-glued them with 527 (which you can buy in the craft section). Let the glue dry and then you can hang the wreath up. For the pictures I hung it on the door outside, but I normally keep it inside, so I can enjoy looking at while relaxing on the sofa watching TV. 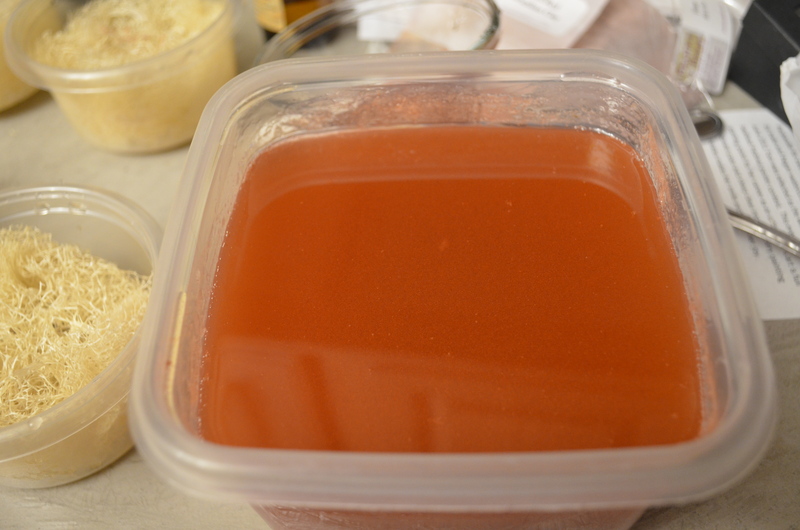 This easy melt and pour soap is a wonderful exfoliant that smells like a sweet treat. The loofa makes it a little too rough on the skin (for me at least, the Wolfy man loves it all over), but it feels great on those rough heels that have been abused from the summer flip flop weather. Plus with the texture the loofa adds it makes a very cute display sitting in the bathroom. 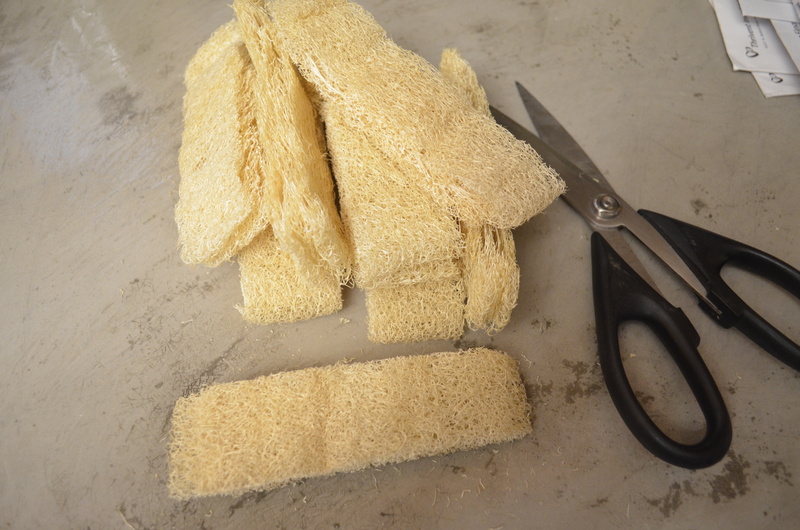 The first step is to cut the loofa into 4 equal sections. In the picture below I ended up cutting up two loofas. 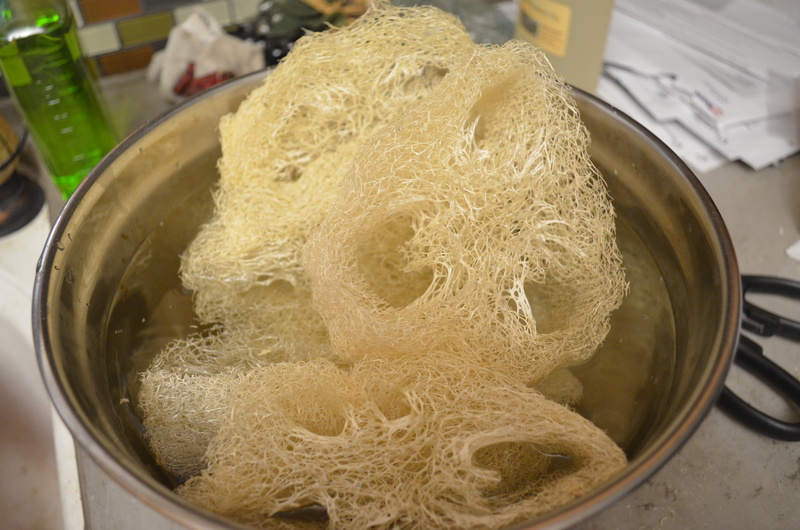 Once the loofa is cut it needs to be soaked in hot water to rehydrate (it won’t take long!). 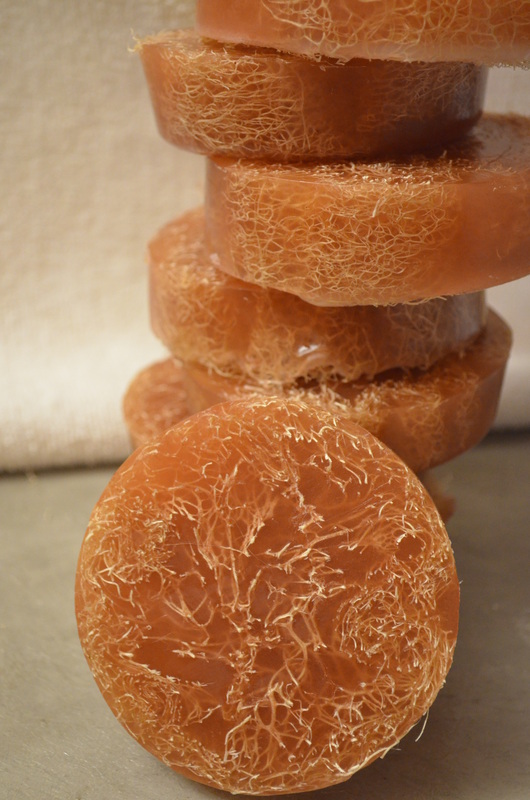 While the loofa is rehydrating, cut the soap bases into 1 inch cubes and put into the microwave on 30 second bursts until melted. 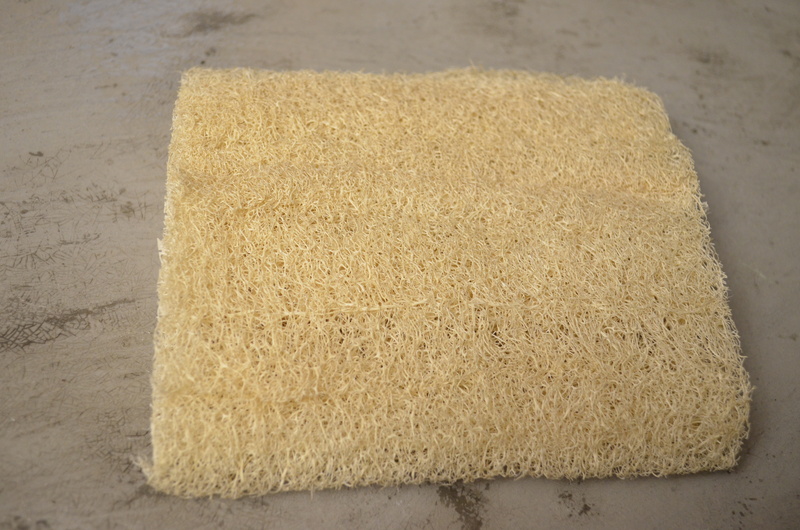 While the soap is melting, turn your attention back to the loofa. 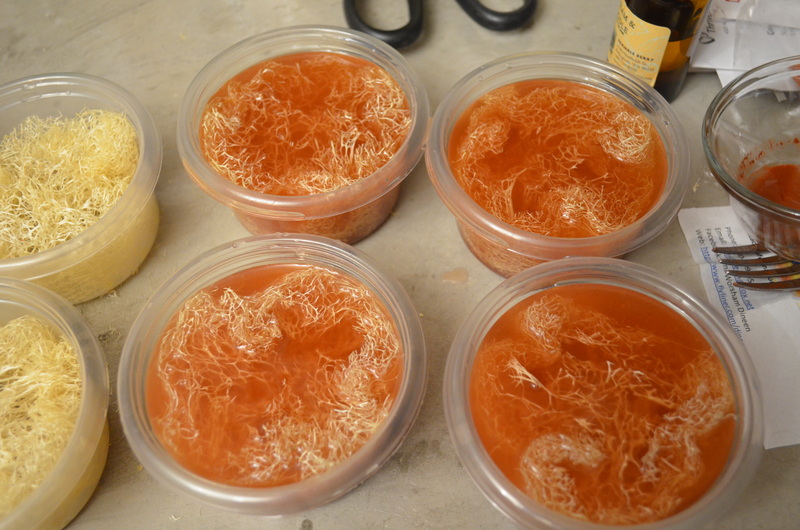 Put the loofa into containers (I used plastic food containers that were just slightly smaller than the loofa). Once they are in the containers, turn them over so any extra water can drain out. While the soap is melting, the clay needs to be rehydrated. 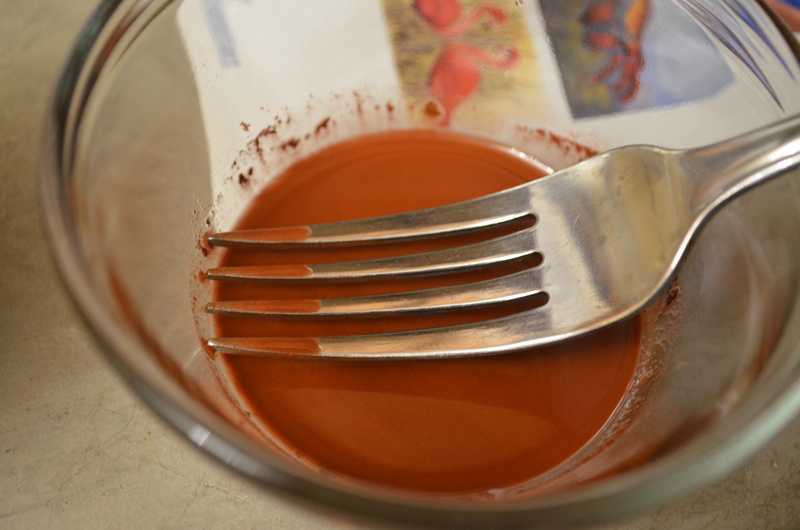 For this recipe I mixed the red Brazilian clay with the sweet almond oil. When the soap is melted, add the clay and mix well. 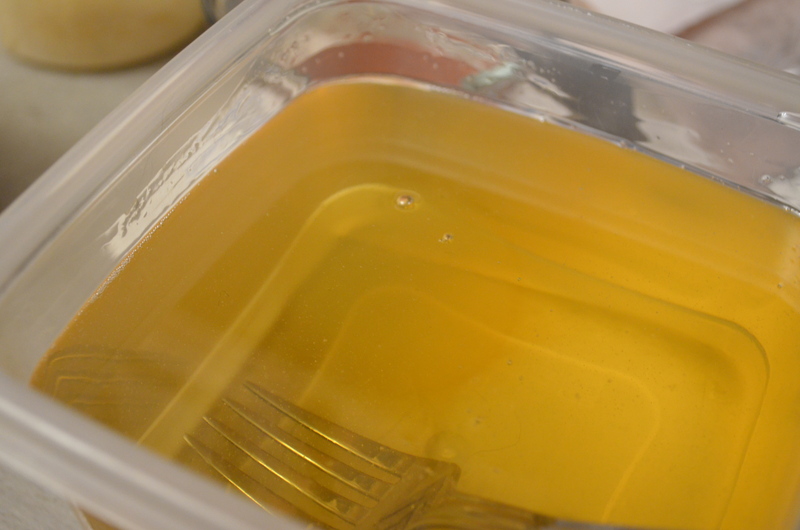 Then add the fragrance oil. 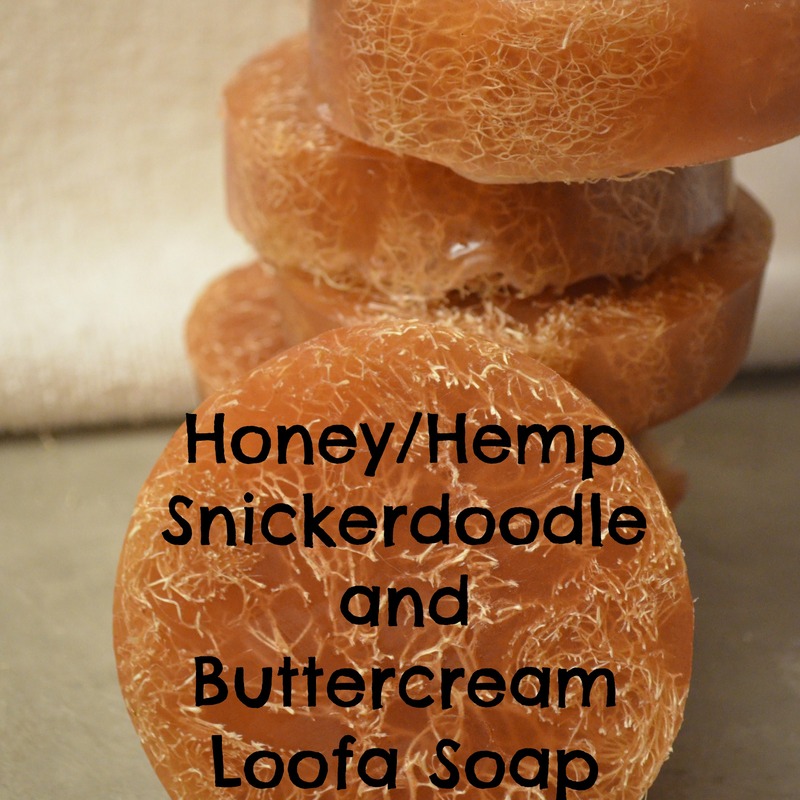 Turn the containers holding the loofa right side up and then pour the soap mixture over the loofa. You want it to just cover it. Spray with rubbing alcohol to remove any bubbles. Once the soap has set up (couple of hours) remove from the container by lightly pressing and pulling on the sides to break the air lock. You can then use a sharp knife to cut the soap in half. That way you have roughly a 4 ounce bar instead of an 8 ounce one. 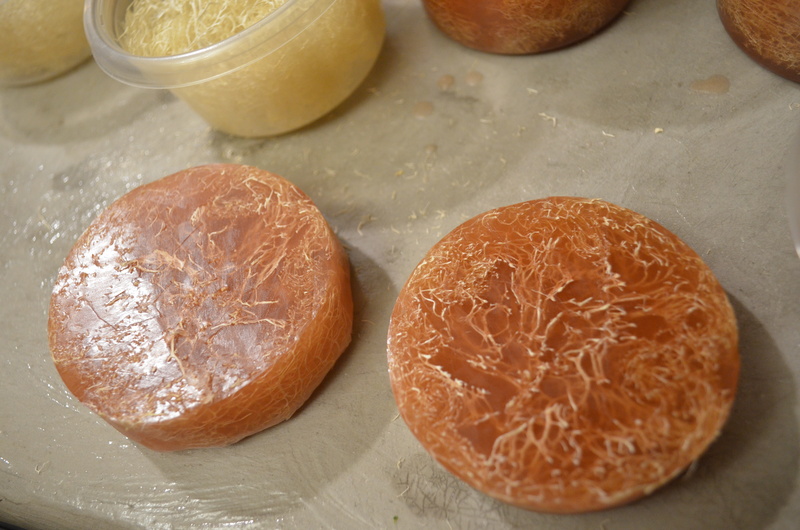 The next day you can enjoy your new soap or seal it up from any air. 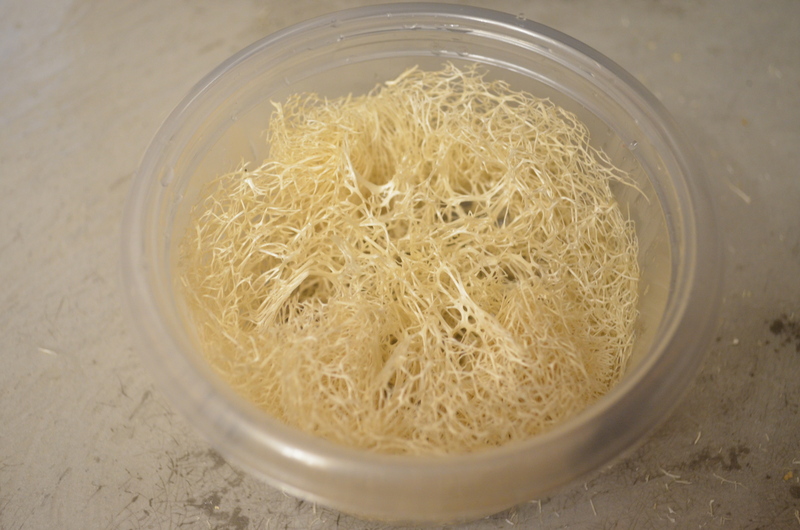 Categories: Melt and Pour, Soap Making | Permalink. We drank the bottle with dinner (salad) and had the rest while watching TV. Overall it is something we enjoyed and would buy again. 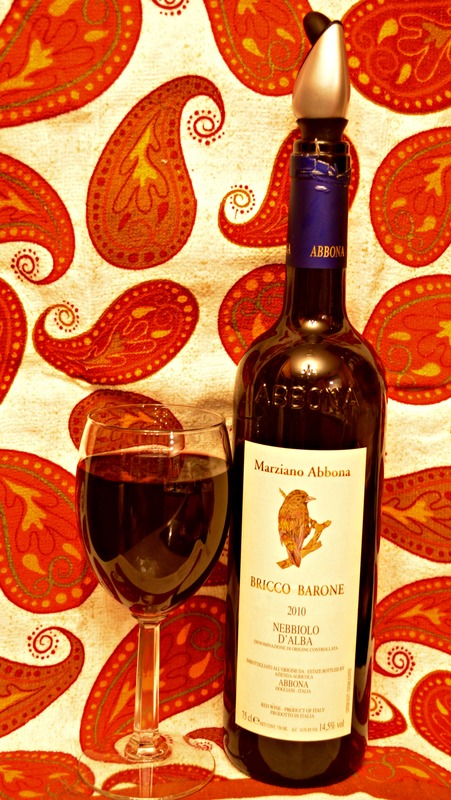 Categories: Wine, Wine Reviews | Permalink.